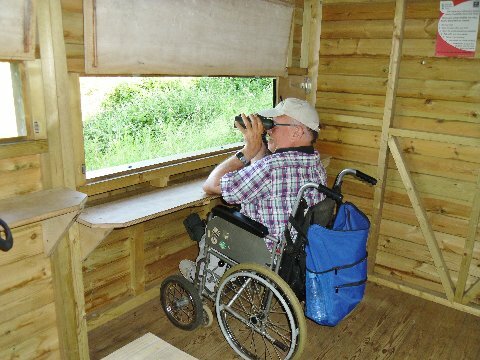 Our primary objective has always been to try and improve access to all facilities that birders use, whether they be reserves and hides, birding equipment or accommodation and transport. Below are some features which we hope are seen and used by providers. We can always give information of dimensions etc. and are happy to give further advice or site surveys. We have also produced a ‘best practice’ guide for reserve wardens and others. It is an outline of those issues that need to be addressed rather than a comprehensive guide but it is a good place to start! Visit the Best Practice page for full details and to download a copy. You can download our assessment form here: Download the ASSESSMENT guide here. ‘Leg’ room – there needs to be sufficient space for a wheelchair user to get to lean their elbows on the ledge and this means a slot for the front of the chair and the users knees to be forward of the ledge. Ledge height – the ledge needs to be low enough for someone to lean their elbows from the sitting position of a wheelchair. View slot – this obviously needs to be at the right height (probably being overall bigger) than the ‘normal’ slots and, if there are covers, their catches need to be accessible from a sitting position (which the one below isn’t!). The single most useful enhancement for anyone who is ‘hard of walking’ is the provision of simple benches every 100m to 150m along paths and tracks. Many people who have restricted mobility find it hard to walk very far, either because they are very slow, very stiff, getting more stiff the further they walk, or who get more pain the further they walk. On their ‘good days’ they may manage as much as 300 meters… but this is a round trip so 150m in one direction is a limit for many. 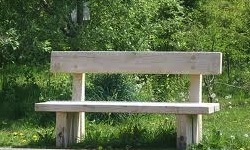 The provision of a bench means they can rest, ‘unlock’ and wait for the pain top go away before retracing their steps or pushing on to the next rest spot. It is vital that each resting place is measured accurately and the distance given to the next stop (obviously geography and conservation needs may inform the exact positioning, so 100m-150m is a guideline). It is also important that the resting walker can view wildlife from where they rest. 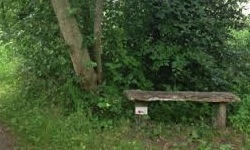 (If site diagrams or brochures show the reserve layout such benches should be named or numbered). The minimum provision is a ‘perch’ this is a pole between two uprights at a height where one can ‘perch’ rather than be seated. Better still is a simple ‘bench’ of two uprights and a plank at ‘normal’ seat height (higher is better than lower as it is easier for people with mobility problems to rise from a higher position). The absolute ideal rest stop is a bench that has some form of backrest… not only is this more restful, some people with balance issues will be unhappy where there is nothing to lean against. In some places I have seen natural features (such as storm downed trees or boughs) converted into rest stops. The most bird-friendly mobility aid I’ve ever seen was a boardwalk having ‘lay-bys’ with seating opposite handrails that acted as small water troughs catching rainwater for birds to drink from… I’ve sat quietly on such a bench and seen songbirds etc. coming to these ‘troughs’.